Few things found during the eye exam are more ominous than a swollen optic nerve, and any apparent elevation or swelling can raise suspicion about serious health concerns. But truly differentiating real optic nerve edema (swelling) from anatomical variations of the nerve that cause it to be elevated in appearance can be difficult during the eye exam. Luckily, there are a few tell-tale signs to look for during your examination that can help make differentiating normal optic nerves from those that need prompt referral for MRI to rule out a larger issue. Can You Tell Which Picture Has True Optic Nerve Edema? True optic nerve edema is associated with a change in blood flow to the eye. Swelling of the nerve tissue around the vessels as they enter and leave the eye in acute cases of papilledema causes congestion of the blood vessels; resulting in a more pronounced reddish color of the entire optic disc. 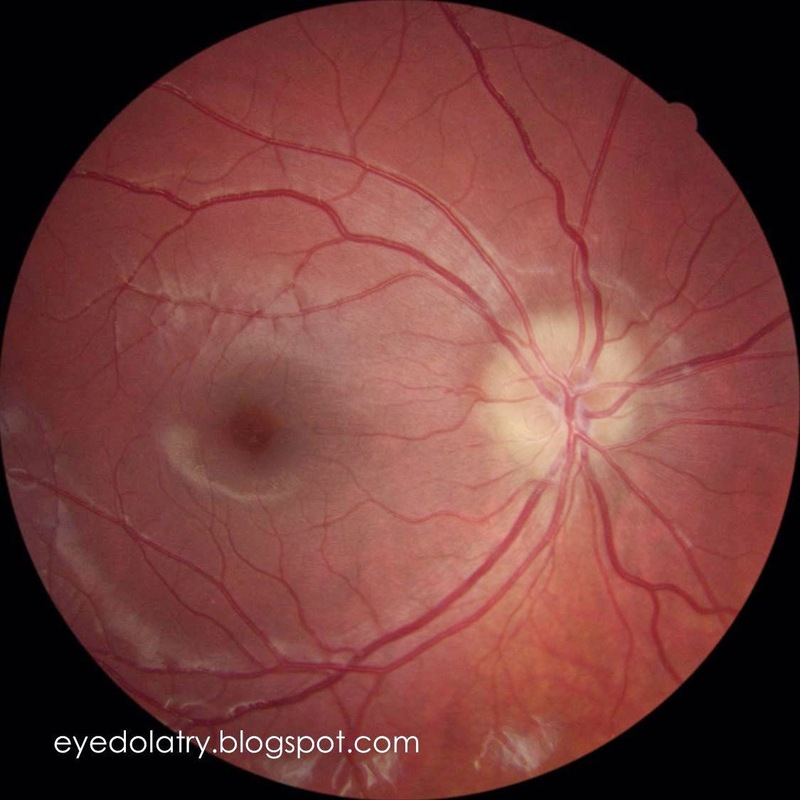 Longstanding optic nerve edema would not have this reddish appearanc; ischemic syndromes like NAION that are also associated with a swollen disc are less likely to have hyperemia of the disc because blood flow to the the nerve (and the eye as a whole) has been compromised. Acute edema often presents with flame hemorrhages and bleeding around the disc. If you see hemorrhages, you are likely dealing with true edema. Other common ocular signs of inflammation are also associated with papilledema. These signs can include cotton wool spots, exudative changes, and macular edema. In the bottom picture above, the retinal tissue nasal to the macula shows obvious striae and folds, making the diagnosis of papilledema more likely. 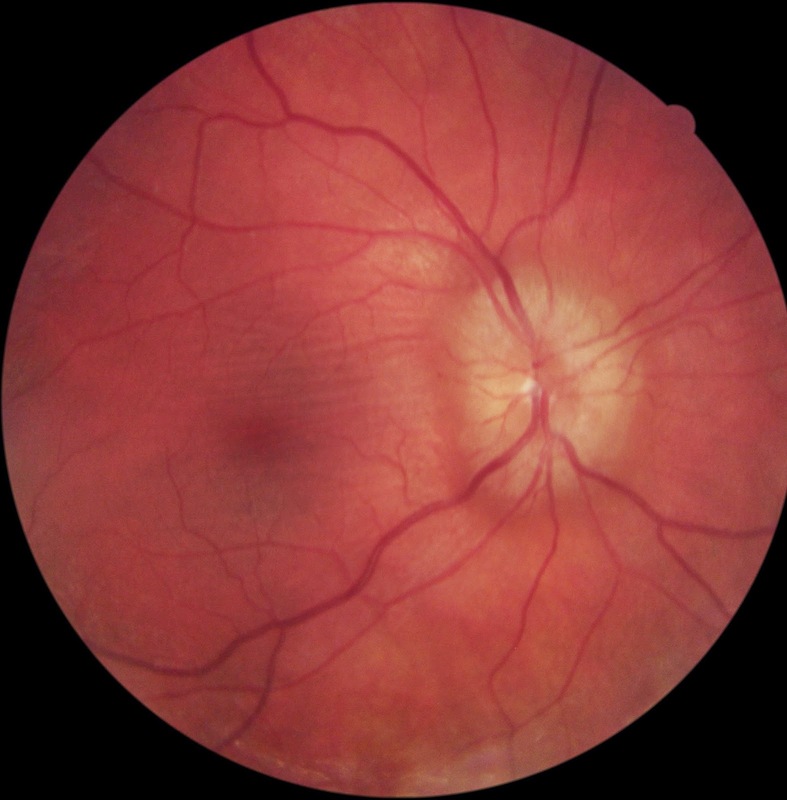 In psuedopapilledema, the retinal vessels leaving the nerve are clearly visible when they cross the disc margin, even if the nerve tissue as a whole looks blurry or indistinct due to crowded and or elevated nerve tissue. In true papilledema, the blood vessels are typically obscured or blurry as they exit the nerve. Depending on the amount of edema present, there may be more or less blurring of the disc margins. The bottom image above is an example of true papilledema that had very little blurring of the vessels as they left the nerve, making this a less obvious case of true edema. In true optic nerve edema, you will never witness spontaneous venous pulsation at the nerve during your internal examination. If you see it, you know you are dealing with pseudopapilledema. It would be easy to think that if the person has normal vision and no complaints, then they likely don't have papilledema. That is not the case, however. In fact, acute papilledema is typically associated with only minimal loss of function of the optic nerve. The average patient with acute optic nerve edema has normal vision, normal color vision, and normal pupil reaction. Longstanding edema associated with ischemic syndromes like NAION are very likely, however, to have significant vision side effects. Just because your patient doesn't have any symptoms -- no headaches, no vision changes, no visual auras or disruptions, they could still have papilledema needing prompt referral for imaging.